The Maroon SM3 (pictured to the left) was in a rough-ish state. 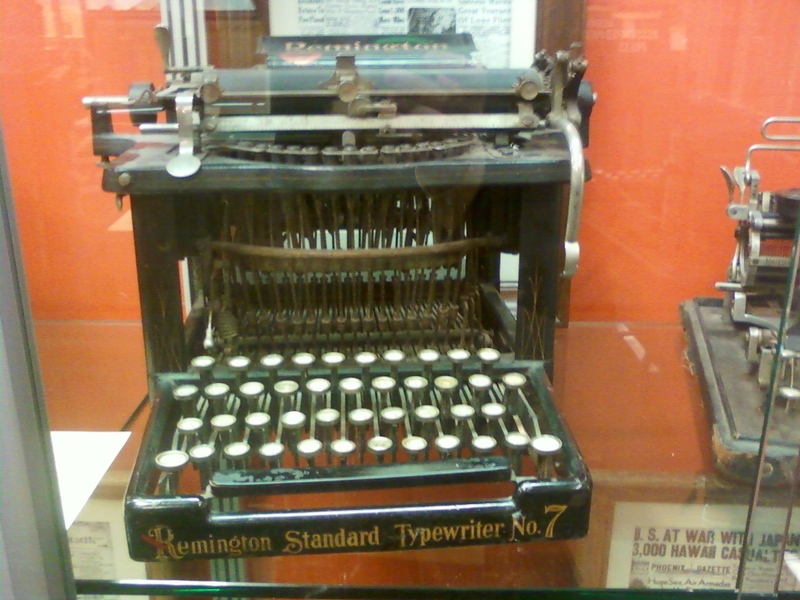 The carriage return lever struck the body, the carriage itself wouldn't move very easily, and the typebars were a little sticky. I was confident that I could take this machine and restore it to some semblance of it's former glory. At least, that was the plan. The restoration started off well enough. I took my time and removed all the body panels. There was all manner of garbage hidden behind those panels. I took my time using penetrating oil to clean the mechanism. Everything loosened up and worked very well. Then, I tried to re-install the machine into the body panels. For some reason, after the outer case was screwed down, the carriage refused to advance using the spacebar. That is not entirely accurate, the spacebar would advance as far as the next tabulator stop. The spacebar is actuing like a tabulator! I am sure that there is some small spring in the escapement that worked loose, but it's disheartening. The carriage was moving well before this little set-back. Back to the bench it goes. 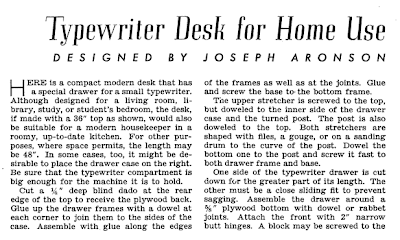 I am sure that every typewriter enthusiast has a similar story. It's part of the learning process. Hopefully, I can get it working soon. UPDATE: My conversation with Baco revealed that single spool ribbons are $3. If you have a second spool on which wind the ribbon, this is the cheapest option. I am seriously concidering odering a few extra and seeing if anyone would want them. UPDATE: The link has been fixed and the PayPal Button should work. 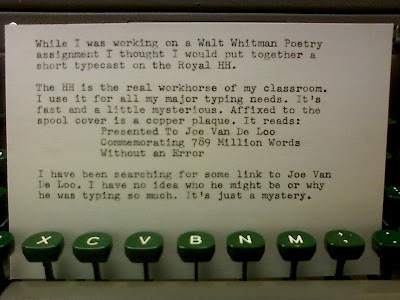 With as many typewriters as I have here in the classroom you can imagine that they get a fair amount of use. The machines are holding up quite well. It's the ribbons that are starting to wear out. 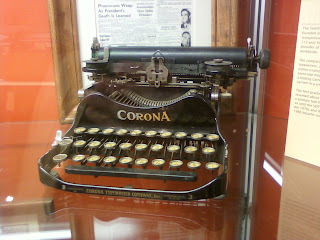 Every period each typewriter is being used. 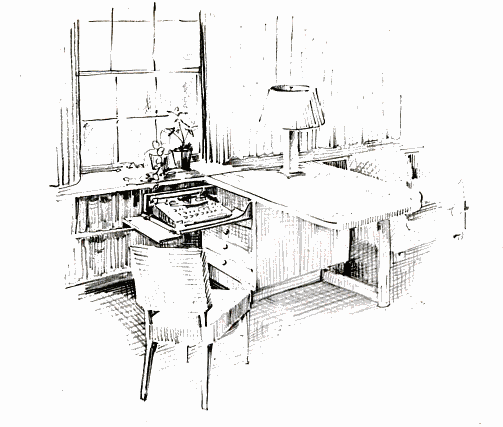 They are primarily used for journaling which is a minimum of 20 lines each day. 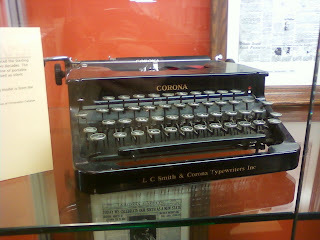 That means that each period the typewriters are used to write 260 lines of prose. Over the course of the day that would be 1300 lines of journals. 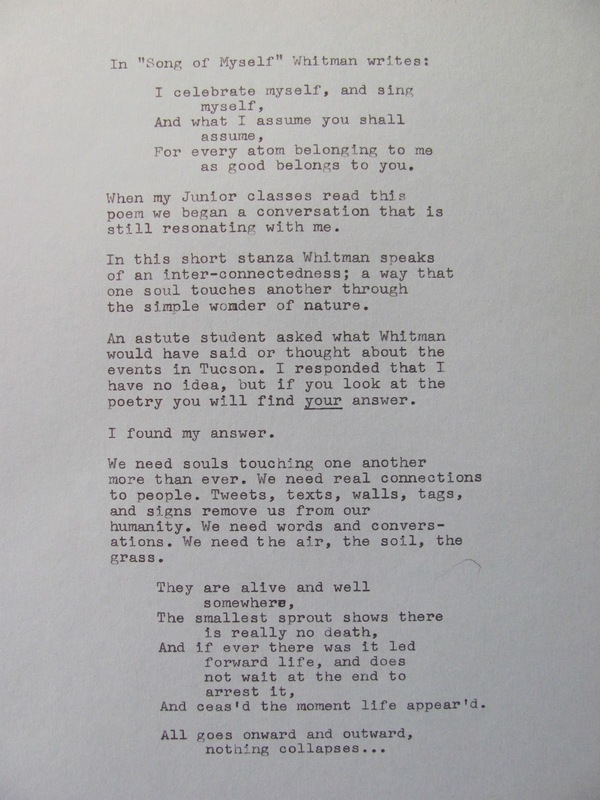 On average each line is about 15 words long. In one day the typewriters are being used to write nearly 20,000 words. I would guess that the average English word is around 5 letters long. 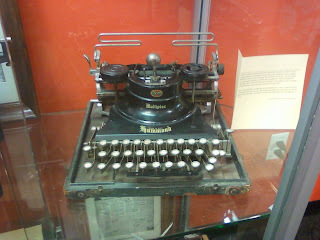 That is a total of 100,000 words per day (or 7700 key presses per machine per day). I have not changed the ribbon en masse, yet. We have been doing this about 4 months. If you do the math, each ribbon has been through a minimum of 677,600 impressions. I need ribbon. Lots of ribbon. I really want to find a place where I could get it in bulk and wind my own spools. All of the spools in the machines are metal and can be reused. The trouble is finding a distributor. I think China is the answer. I sent an email to my uncle who is an importer and knows his way around business in China. With any luck I can find some inked ribbon. No, they won't erase that lingering ennui. 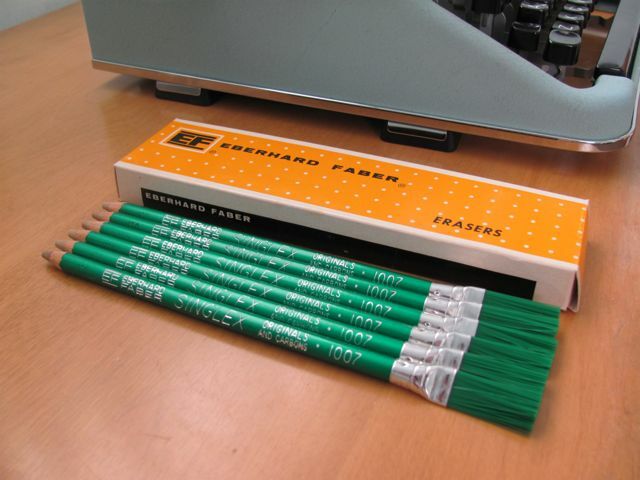 I still have 5 erasers that I would absolutely love to give away. These work on typewriter ink, carbons, and regular pen. They can be really useful. Drop me a line at tryanpa@cox.net. I'll send you one in the mail. Click here for the original post. Performer? 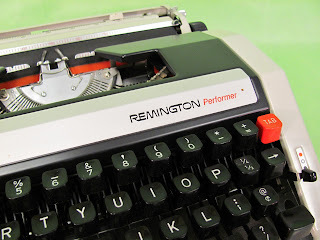 Reach for that lowest star, Remington! As it is a carriage-shift, the shift key is a little stiff. Typing on it is only acceptable to good. The sound proofing is not adequate and sounds like you typing on a pilchard can. I'll beef it up with some spare felt when I have a chance. This Remington has all the features of a late-model typewriter; repeat spacer, paper support arm, pre-set tabulator, key de-jammer/margin release key. 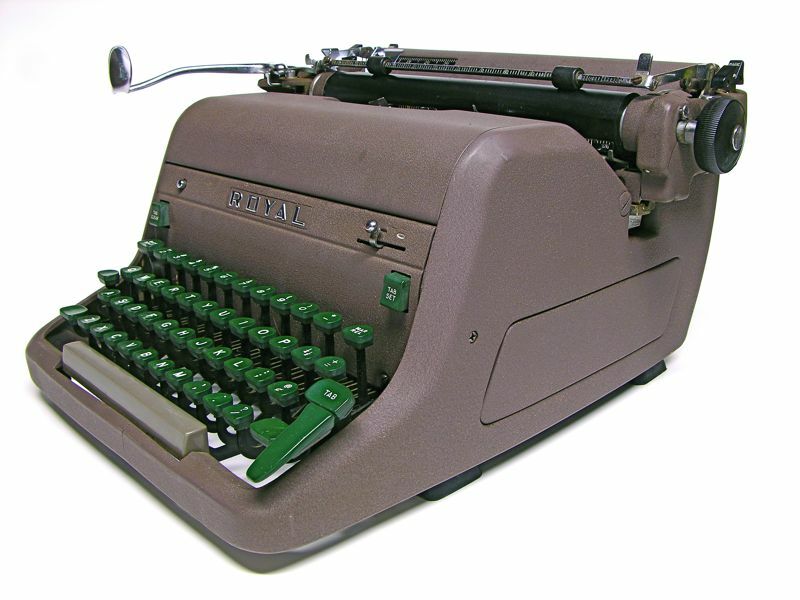 It shares a more than passing resemblance to some of the last typewriters made today. That is not a coincidence. This Brother mechanism seems to live on in many variations and labels. Reconstructed from a very soggy, chewed original. Our home has a one-year old who loves paper. That's why there is no typecast in this post. My son ate it. Trust me, it was a wonderful typecast. 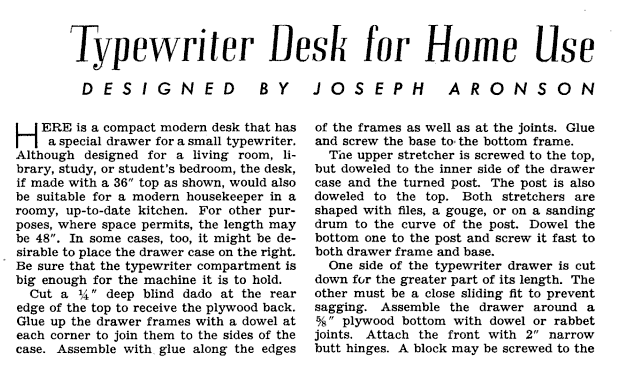 Anyway, a little web-surfing came up with this interesting article from 1942. I took a look at the dimensions and this would be the perfect home for a QDL. I have been working on several versions of the posters for the Phoenix Type-In scheduled for March 5th. I've finished one version in B&W that can be printed on 11x17 paper. There is a smaller 5x7 size one to the right of this post. As the days progress I hope to finish all the other sizes. The plan is to go to some of the more interesting independent coffee houses and stores and ask them to post them. With any luck I won't be the only person there. UPDATE: All the psoters ahve been done and I have contacted several local media outlets. We'll see what happens! I was down at ASU Downtown at the new Walter Cronkite School of Journalism building. This is also the home to our local PBS station, KAET Channel 8. In the school there is a small museum where bits and pieces of Arizona broadcasting history are on display. There is a large selection of ephemera related to the famous Arizona reporter Don Bolles who was murdered in a mafia-related bombing. There is also a very interesting Associated press wire machine that still has the last story it ever received (the day Gorbachev became premier of the USSR) ready to take off the roll. 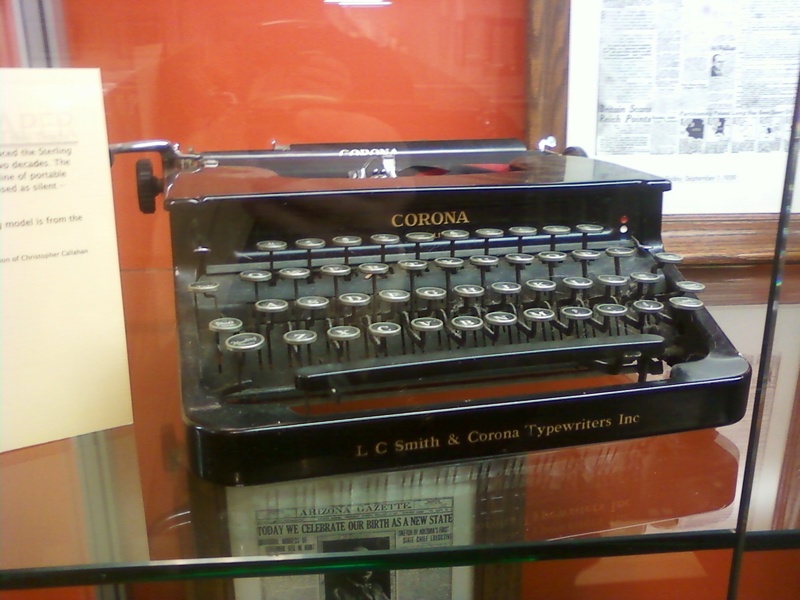 There is even a collection of Walter Cronkite's famous pipes, but what really exited me was a small collection of typewriters. Take a look at the pictures below. 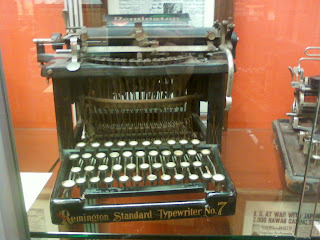 The quality is low because the only camera I had was in my wife's cell phone and all the machines are behind glass. Not entirely unlike my HH. This afternoon I was working on seating charts. You would think with all the smart-boards, computers, and projectors in the modern classroom there would be some amazing way to make seating charts, but my seating charts are byzantine documents that take hours of toil to craft. Our attendance system doesn't offer an easy way to craft the kind of chart I need. That's where the Royal HH comes in handy. It has a 13" carriage which is tailor made to accept the landscape forms that I use. When I set up the tabs I can get through a seating chart in very little time. It's the tabulator key that makes this machine great. It's larger than a normal tab key and placed to be activated with the fleshy part of your pinkie. 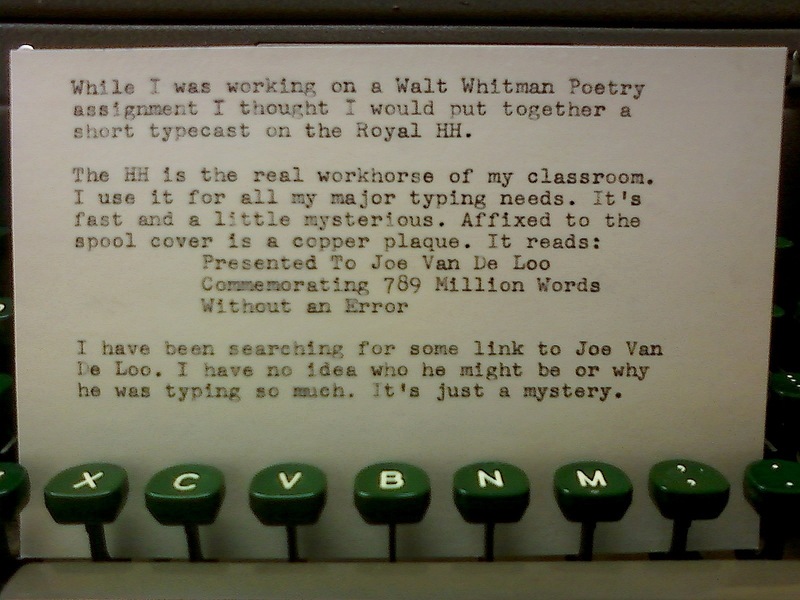 I don't think that there is another tab key like it on any typewriter. The proper placement of a tab key is important. On the Hermes it is in a strange location that takes a conciderable ammount of time to learn. The HH tab is easy to activate without looking. Well, as I was using the tab I nocticed that the carriage was slowing down mid-travel. A quick call to Mesa Typewriter Exchange (the last typewriter repair in the Phoenix area) help me figure out that it is either a dirty, sticky carriage or the tabulator brake. When I get a little time and money I'll take it on down and have it cleaned and serviced. It's a wonderful machine that I would love to keep for a long time. I have a million of these to share. 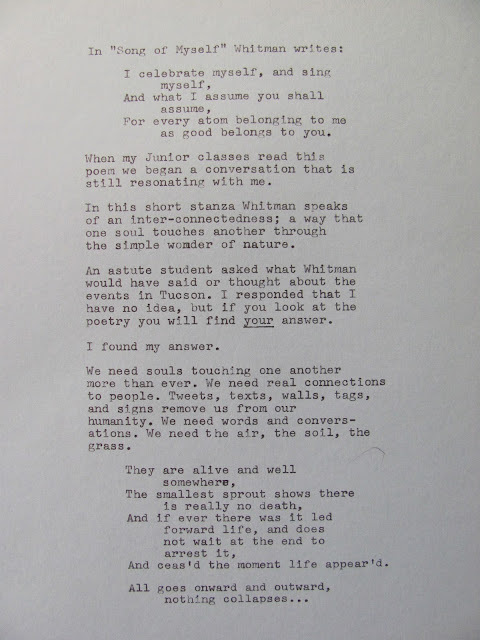 This one, in particular, was written by Oscar who is not a native speaker of English. His grammar and usage is frequently non-standard he can be understood. It is his typing that is really special. This typecast is typed beautifully. Please enjoy! Well, I've gone and done it again. I bought anouther Olympia. Did I really need it? Not really. But this new machine means that I can try the dunk method of cleaning. In the February 1957 edition of Popular Science the process is presented. 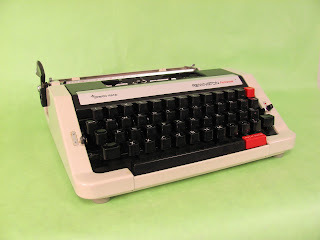 You can find it by searching Google Books for "He Dunks Typewriters"
It looks like a simple process and with the plastic keys of the Olympia there is little concern with water wicking up under celluloid keytops. I plan on documenting all the steps in photos for your enjoyment. If the dunking is successful, I have a few other machines that need a deep clean.